...that the Black Armory contains the most powerful weapons of the Golden Age? 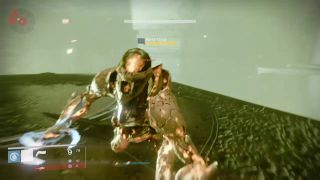 Blind Thralls are a unique variant of Thrall that are tasked with guarding a Scent of the Worm Chest in the Mausoleum on the Dreadnaught. Blind Thrall will spawn once the player begins to approach the Chest, crawling out of pools of black water. They will be completely immune to damage. They behave like ordinary Thrall except when the player leaves the platform they will retreat into cover.